Hurrah… summer is here at last! Which is brilliant, except that my polymer clay pretty much turns to sticky toffee in this kind of heat. Not to worry, if I can’t sculpt at least it gives me the incentive to write a long-overdue blog entry instead. I’ve decided I need to be less ‘precious’ about it and just get on and write/post more frequently. It’s blogging, not the Bayeux Tapestry. There’s an edit button. So… last time I blogged (way back in 1970 or so) I was telling you about my first dog, Puppy. After I lost her, I lasted all of about two weeks without a dog in the house. Those weeks were awful. I had no one sensible to talk to, I could finish food without feeling guilty and if I dropped a piece of toast it hit the floor. And it struck me that while I was sitting feeling sorry for myself, a dog was sitting in a cage somewhere and Puppy would have hated that. I headed to Battersea Dogs and Cats home with two instructions, ‘not too big’ from the dog sitter (my mum) and ‘something that’s not too boisterous and won’t get too muddy’ from my partner at the time. I walked around wanting to take home all the dogs, until one in particular caught my eye. Or rather she didn’t. One of the enclosures I passed appeared to be empty and I peered into the kennel area before I realised my mistake: I had been looking on the floor, where the other dogs were. I didn’t know how she had got there (more on that later) but MY dog was standing on top of the kennel, at face level, looking quite pleased to see me. I checked the label on the door, where most dogs had some notes about behaviour, preferences etc. This one just said ‘Tan mongrel. Food obsessed’. 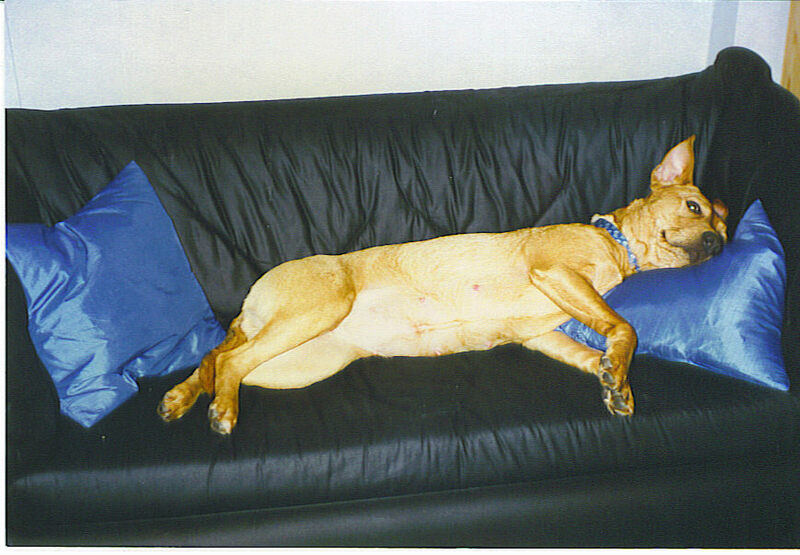 …and one of her fat belly enjoying the sofa after her first Christmas dinner. Anyway, back to Battersea. She hopped off the kennel and came to say hello. 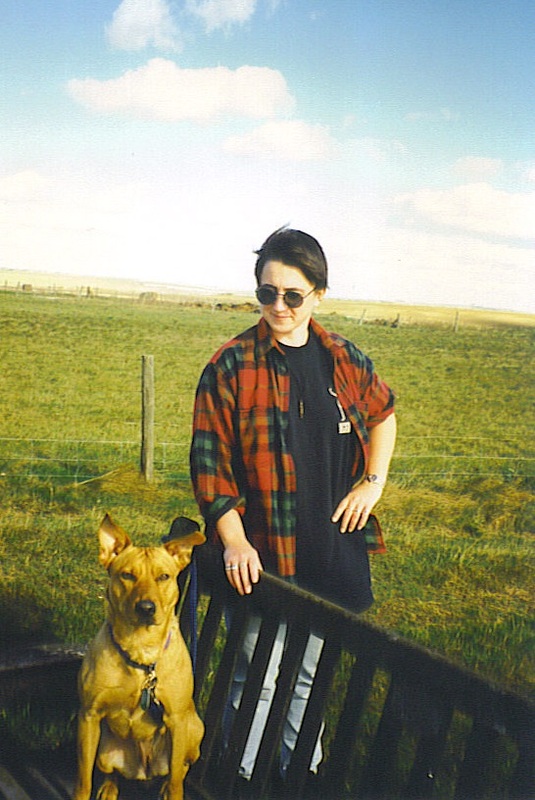 She was a Staffie/Labrador cross, quite a bit bigger than my first dog and I felt ‘tan mongrel’ was a bit harsh; she was quite clearly complex shades of ginger, light brown and blonde, whose hair would shed noticeably on every single article of clothing I owned. I decided at once that I wanted to meet her, so I headed off to fill in a rehoming application and register my interest. When I started to leave she howled, grabbed my sleeve and wouldn’t let go. I managed to extricate myself and promised her I would come back, as she let out a series of blood curdling squeals and bounced off the walls. Not too big or boisterous, I kidded myself. Oh, it would be fine. Who wouldn’t love her? One successful home visit later I went back with… right, we need a shorthand for my ex-partner who wasn’t particularly keen on dogs. Let’s just call her ‘Cruella’. What? It’s my blog and I’m sure she calls me much worse. The staff took us to a side room and went to get my ‘tan mongrel’. In she came sounding like a steam train, straining on her lead and pulling the kennel worker behind her. They let her off and she proceeded to spend the next 10 minutes jumping all over me, chewing my clothes, licking my face and bouncing off the walls again. Cruella looked on in horror but it was love at first sight for Honey and I. As I had a cat at the time, she also had to be ‘cat tested’. This involved taking her to the cattery (where the cats were all safely in their enclosures) and seeing how she reacted. How she reacted was to completely ignore the cats and make a bee line for a lady who was looking into an open enclosure. This lady promptly met her potential new feline companion at rather closer quarters than either of them was expecting as Honey jumped up at her back and shoved her headfirst into the cage. “Sorry!” I said, for the first of many, many times, even though I wasn’t even holding her lead yet. Cruella glowered and asked if I was sure I wanted *this* dog. Oh come on, hadn’t she been watching? I mean, sure she was 25 kilos of completely untrained ginger muscle but that was hilarious. Even the lady with the cat attached to her face saw the funny side. I paid the adoption fee and headed off to get her microchip fitted. As they took us into reception and handed over the lead she recognised that she was going outside and started to squeal. I say squeal, it was more of a scream. The sort of noise you may have heard foxes making at 3am. “Sorry!” I said, as I smiled and pretended she wasn’t pulling my arm out of its socket as I tried to hold her still. Suffice it to say that the first microchip needle went into the vet. She was very nice about it and waved us off with a cheery “Good luck! Come back and see us if that… noise becomes a problem” as Honey screamed her way to the door. “Sorry!” I said to everyone in reception and hoped none of them were suffering permanent hearing impairment. Even I was starting to wonder if I’d been entirely sensible, until we got to the car. Honey took one look, decided she wasn’t sure what this was all about and flatly refused to get in. I did ‘happy voice’, bribed her with treats and attempted to lift her, which was like trying to juggle a sack full of ferrets. Finally, I gave Cruella the car keys, got in the back seat and said ‘come on then!’ In jumped Honey without a second thought, squashed herself as tightly against me as she could and settled in for the ride. Because she was my dog and we both knew it and that was just the way it was. More on Honey soon, including ‘When Honey Met Lucy’ and ‘the ‘The Curious Incident of the Dog in the Kitchen’. Ok, I confess one of my New Year’s resolutions was to blog every month in 2016 and I didn’t quite manage to publish this in January. I was close though. Ah January… the month when everyone gives up alcohol and lives on salad and regret. I have always thought February was a much more sensible time to start the après-Christmas health kick. It’s easier when your house is no longer full of chocolate and random liqueurs and the freezer is free of small things wrapped in puff pastry. So am I going to be blogging about healthy lifestyle changes and sharing my recipe for kale smoothies? Am I heck as like. Instead, I thought I might attempt to answer a few frequently asked questions over the coming months. I share a lot of dog-related stuff on Facebook and Twitter and people often ask what kind of dogs I have myself. No one who knows me will be surprised that I am using this as a flimsy excuse to write about ‘dogs I have loved’ and knowing my audience, no one will be disappointed about it either. My first dog was Puppy, so called because I wasn’t going to get attached. I know how ridiculous that sounds but hear me out. I found her wandering about a busy High Street when I was 18 and still living in South London. Or rather she found me and happily sat with me while I fussed her and made sure she didn’t run off into the road. She was a pretty little thing but I had no idea what breed(s) she was and still don’t. She looked young and a bit on the skinny side but she was wearing a collar, so I assumed she had just found her way out of someone’s garden. When no frantic owner showed up, I took her to the local police station but the Plod were not interested. They told me they already had a male dog in their kennel, so I could either sign to say I took responsibility for her or they would send her straight to Battersea Dogs Home. Guess what happened next? Well played, Police Officer who didn’t fancy looking after a dog that afternoon. I was told that if she wasn’t claimed after 28 days, she would be mine. This being ye olden days before the interwebs I slogged around all the local vets, pet shops and such, leaving her photo everywhere. She even got her picture in the local paper but no one called. As time passed, I couldn’t imagine what excuse her owners could have for not finding her sooner. Finally, after 27 days, someone rang. I went to the phone ready to read them the riot act but it was a family who had seen her in the paper, offering to take her in if she hadn’t been claimed. That would have been an ideal solution, as I was a penniless student in rented accommodation with no idea how to look after a dog. I opened my mouth to say so and found myself telling them I couldn’t bear to part with her. Obviously. 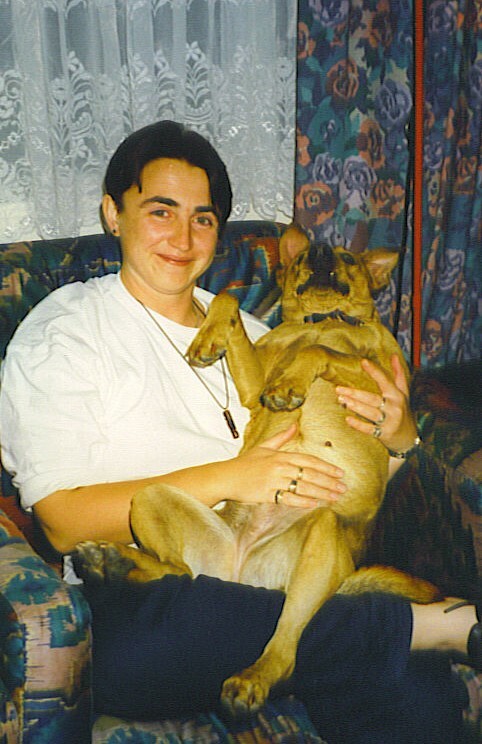 By that point she flatly refused to answer to anything but Puppy, so Puppy she stayed for the next 16-ish years. 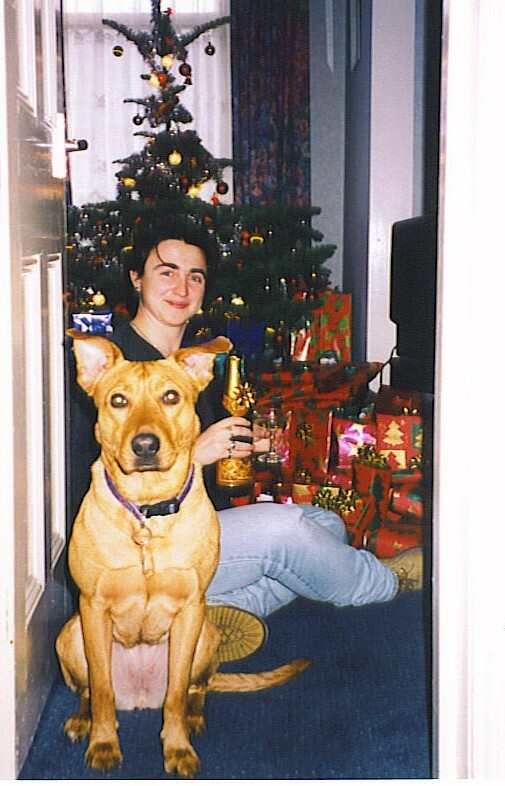 I had always wanted a dog and she became my best mate as we learned how to do the ‘dog and owner’ thing together. Some of the stuff we got up to makes my hair curl now but if she knew it was bad for her to eat crisps or drink light ale from her own little bowl in my student local, she never let on. *Please* don’t do this with your dog. She may have lived until she was 16 but it was pure luck; I’m assuming she just happened to have the constitution of a canine Keith Richards. She grew up into a very healthy dog, despite her illicit teenage pub treats. She loved her walks, enjoyed a swim and once had the time of her life riding a sled with me in a snowy Richmond Park. She was ‘mum’ to a cat I also came by accidentally (that’s another story – animals find me). She never really liked to be left alone and after I learned to drive she would come everywhere with me in the car. When I worked in the wine trade she would shamelessly snaffle goodies from catering staff while we were making deliveries. Like most ex-strays, she loved her food. When she stayed with my mum they would often watch a film together and share some snacks. I know this because I would go to collect her and find the pair of them looking guilty and covered in popcorn crumbs. I was devastated when I finally lost her and I wasn’t sure I could have another dog any time soon. Then I learned another truth, which is that once you’ve been owned by a dog you will never feel right without one. The house was much too quiet. If I dropped food, it hit the floor. I had to talk to myself or the cat, who was a fabulous cat but didn’t really care about my human nonsense and had no interest in going for companionable road trips. More importantly I realised that all the time I was sat feeling sorry for myself another dog was waiting in a rescue cage somewhere, so before long I found myself at Battersea with strict instructions from the dog-sitter (my mum) to get something ‘not too big, that won’t get too muddy’. Which… didn’t quite work out. This blog is turning out to be longer than I planned. You know what it’s like when you get talking about dogs. Never mind, it can become a short series instead. Next week: Honey the ‘pedigree Stafrador’. So here I am, a little over two weeks post-op and starting to feel much better. For those who want the technical particulars, I had a ‘right-sided L4/L5 decompression and fusion’ but don’t worry, this blog will contain no graphic details and I’m not going to share any pictures of my fancy new scar or the rainbow colour progression of my bruises. Everything went really well but inevitably, because this is 2015 (see last blog entry), there was a bit of drama too. I had to check in to the hospital at 7.30am on the day of my surgery so, to avoid getting up at silly o clock and rushing around, we arranged to stay at a nearby hotel the night before. We set off on time and had an uneventful journey until we approached the road where we were planning to park and fire engines started screaming past us. “Ooh, hope the hotel isn’t on fire!” we chortled. And yes, you’ve guessed it… the hotel actually was on fire. Which was hilarious an hour or so later once we were sitting in a room at the local Travelodge (which was not on fire) but a bit tense when we were driving circles around a roadblock in the centre of Birmingham trying to find out what was going on. Anyway, since I’m not allowed back to work yet and have way more time on my hands than I have things I am capable of doing to fill it, I thought I would share my top tips for anyone about to go through similar surgery. Or anyone who just fancies a bit of a laugh at my expense. I’m not proud. My number one top tip for any hospital trip – be nice to nurses, even if you’re really fed up. Most importantly because they are generally lovely folk doing a really hard job for which they deserve much gratitude and respect but also because they are the ones who are really in charge of everything. Your consultant doesn’t know where the extra blankets are kept and won’t make you a slice of toast or pop into your room for a chat if you can’t sleep. Be nice to the catering and cleaning staff too, because they also deserve respect and you get extra biscuits. Don’t be brave, take the painkillers. Related: don’t make any important life decisions at this time because the painkillers may make you drowsy and/or confused. You may hear colours. Or write a blog entry which ends up a bit whimsical banana marigolds bcaus sentences nt quite make. write. 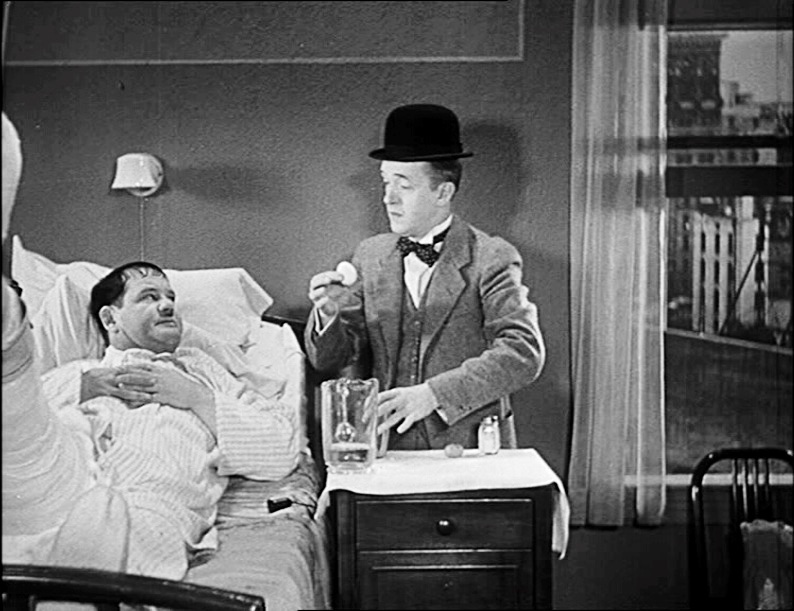 Speaking of painkillers… there is another side effect to general anaesthesia followed by a diet of morphine and codeine which nobody will mention until it is too late. I’m just going to come out and say this – if you ever want to poop again, start taking something a couple of days before you get anywhere near a hospital and do not stop until you can ease down on the pain meds. This is genuinely good advice and you will thank me for it as you smugly listen to the muffled sobs coming from other patients’ bathrooms. Once you get home, accept that you are going to need help. Lots and lots of help. Previously, you were a person who could put on their own socks or get food out of the fridge. Those days are gone my friend. If you are going to be left alone for any length of time you will have to plan with military precision or you will end up with cold feet, having some cherry tomatoes and a Snickers bar for lunch because it is all you could reach. You do not have enough pillows. Seriously, go and buy ALL the pillows. You will need approximately 23 more pillows/cushions than you currently own to get comfortable anywhere for longer than five minutes at a time. You will be obviously be tired right after the op but while you are recovering, be prepared for random bouts of ‘must sleep here now’. You may not be able to sleep that well at night but ten minutes into the gripping thriller you were enjoying…boom! Nana nap on the sofa. And you will wake up cranky and uncomfortable because you didn’t have enough pillows (see above). You will be instructed only to carry items which weigh no more than ‘a half full kettle’. This will prompt much interesting debate. How big is your kettle? A full bottle of wine probably weighs more than that. How much do I have to drink before I can refill my own glass? This discussion is particularly pointless at the moment because I will almost inevitably fall asleep after a glass and a half anyway. On the plus side, the same instructions also prohibit ‘activities which involve bending or twisting, eg. housework’. Result. It’s not all sloth and indolence though. The amount of time you can spend sitting is severely restricted and daily walking is mandatory. This is amusing for the first few days when a ten minute stroll involves you wobbling to the end of the road and back while concentrating on keeping your back straight and both feet pointing in the right direction. Not so amusing for you, more for your neighbours who will think you are legless at 10.30 in the morning. Buy a ‘grabby stick’ – one of those little claw thingummies with a long handle. I know you feel daft but you will not be able to bend down and you will need it to pick up anything you drop. In fact, with the benefit of hindsight, buy two. Because the first thing you will drop will be the grabby stick. Dogs will love the grabby stick until you become adept at taking food out of the fridge without most of it ending up on the kitchen floor. Also, if you are shortarse like me, when you are well again you will be able to access many things you have forgotten you own because they have ended up on the top shelf of cupboards. Well waddya know? Since I last blogged about being busy but needing to blog more frequently, it’s been even longer since I have blogged. I am a bad blogger. Mea Culpa and all that. In my defence, this year has turned out to be very… challenging. Because I am irritatingly optimistic, let’s focus on the good stuff. In May/June, my best mate and I both turned 50 (I know! I don’t look a day over 29… *ahem*…). I have no idea how this happened. 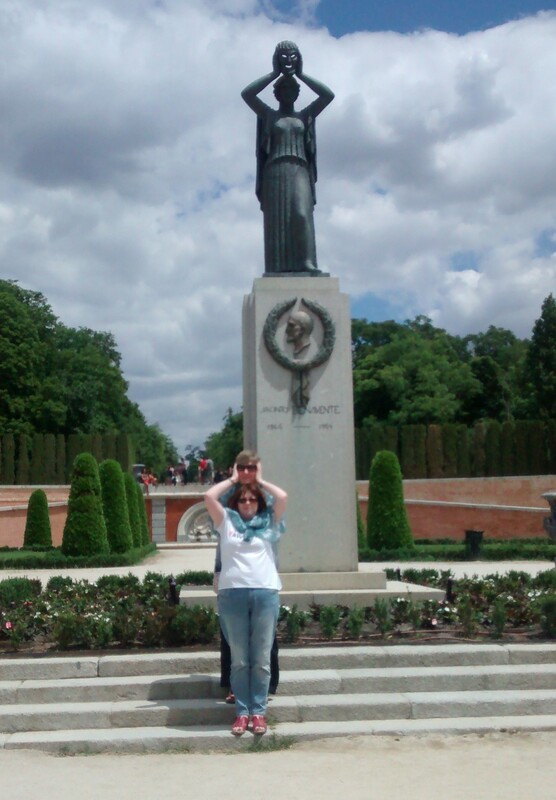 We celebrated by going to Madrid, where we drank far too much and did #statueLOLs. Hurrah! In July, despite working full time at a job with a three hour round commute and covering for several colleagues on long-term sick leave, Luce finished her Master’s Degree in Family Law. Not only that, she graduated with distinction and won the prize for best student. Obviously. Because she is brilliant. Yay! It is hard to be positive about August but let’s try; I finally dealt with many niggling medical issues, including my increasingly dodgy lower back. It had been getting worse for some time but I had been ignoring it until it threw a massive hissy fit and my right leg started hurting and stopped working. September was mostly spent getting irritated and being scanned. Long story short, I need more back surgery. This is scheduled for 29 October, which means that my Halloween and Christmas plans have had to be shelved; more on that later in another blog, one which I promise will happen this year. Luce and I met on 16 October 1998 and we have always celebrated that as our anniversary. When it became possible for us to be Civil Partners, we waited a couple of years and did it when that date first fell on a Saturday. This year, our 17th anniversary and the 5th anniversary of our Civil Partnership, it fell conveniently on a Friday, so the date is really important. You need to remember that bit. We were sensible; we weren’t up to another big party so we arranged a quiet weekend away with four of our closest friends. 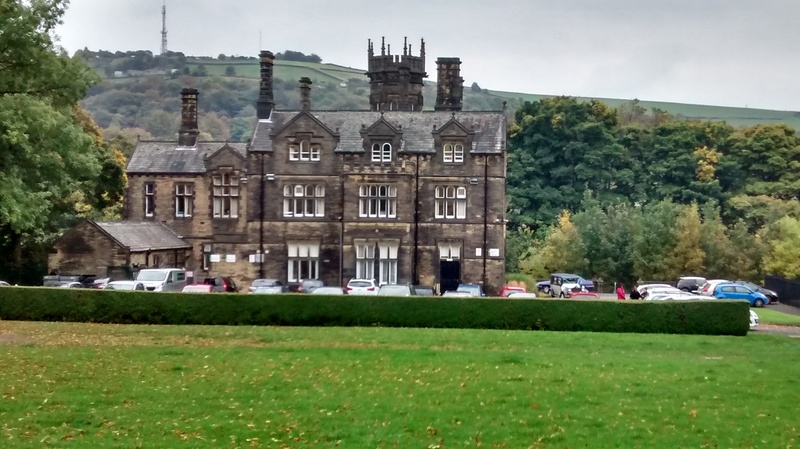 We decided to do the conversion in Halifax, the nearest registry office to Hebden Bridge, where we are planning to relocate next year. We set off in good time, had a great journey, walked the dogs and met up with our friends with half an hour to spare before our 2pm appointment. We discovered that Halifax Registry Office, despite sounding… less than picturesque, looks like this. Who knew? We got called into the registrar’s office and we presented our documents: two proofs of ID and our Civil Partnership certificate. 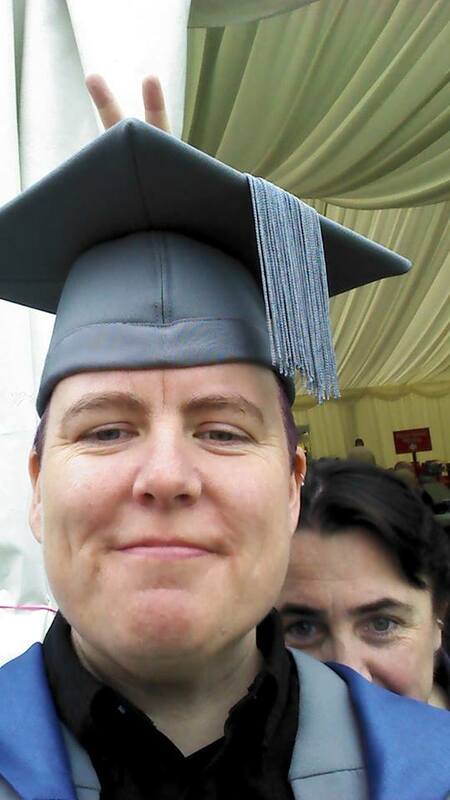 Then – because 2015 – the registrar said “do you have your *actual* certificate?” We did not. Yep. My wife (you remember her, the one with the Master’s Degree in family law. The one who lectures students about it. The one who has been published several times on the subject of Civil Partnerships and equal marriage) had brought the wrong piece of paper. And without the relevant number on that missing document, we were not getting married. Everyone at Halifax was lovely. They tried to ring our local registry office and get it sent over but couldn’t get an answer. The switchboard were also very helpful and we tried for the next hour or so… only to discover that (2015 again) the local registry office close at 2pm on Fridays. We both put a brave face on it but we were devastated. Remember how significant the date was? The marriage would be back-dated to 2010 but we would forever have to put a thumb over the date on the certificate if it didn’t match. Doomily and gloomily we set off for our holiday cottage and the phone rang. We screeched to a halt. Could it be? But no. It was the hospital where I’m having my surgery reminding us about payment. Misery. Phone rings again. Whatever. We pull over again and (because lows but also highs, remember?) it is the local registry office! They send the piece of paper through, we burn rubber back to Halifax hoping against hope that the registrar can still fit us in and… we get married! The relief makes the whole experience one of the best days of our lives and we have a fabulous weekend where everyone ribs Luce about not recognising a marriage certificate and no one cares, because we are married. 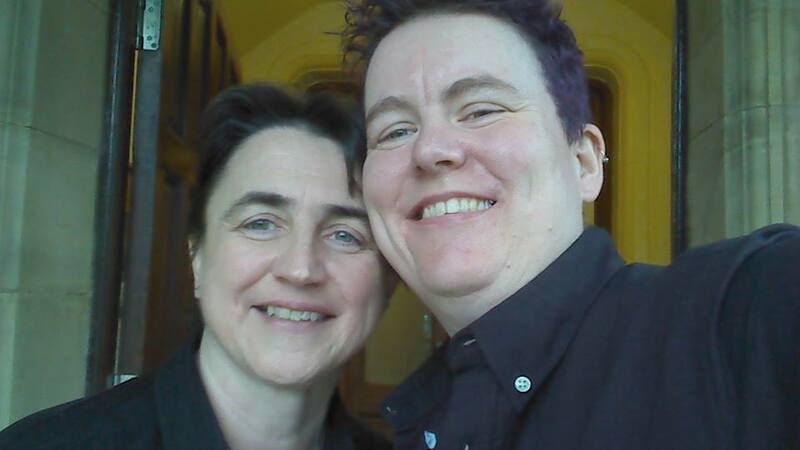 After feeling married for 17 years, we are finally, actually, legally married. And if you spot the lyrical reference in this blog title, you REALLY need to come and talk music with me. My personal life is hectic at the moment. I won’t bore you with too much detail but as many of you know, my wife, Luce, got a fabulous new job last year but currently has a four hour daily commute to Manchester and back, which is not much fun. We’re hoping to move to Hebden Bridge later this year but in order for that to happen we must sell our house in Shropshire and I need time to concentrate on making that happen. Also, a close family member is in the late stages of Alzheimer’s and I am doing everything I can to support them through that. This is difficult to plan for as it often involves dealing with problems as and when they arise. All of which means that I am absolutely frazzled and struggling to keep going with my usual irritating enthusiasm. After much thought, I have decided to close my order book for commission work for a while. I am currently fully booked through March/April and have lots more people on the waiting list, so I need time to catch up. If you have placed an order or sent me an enquiry please don’t worry. All existing orders will be finished (obviously! ), all quotes will be honoured and if I have discussed a project with you I will be happy to book you in if you decide to go ahead. I will still be taking orders for some smaller items too – like slate signs – and I will feature these on my website/Facebook page. I love doing commissions but it is very time consuming; a single piece will often take me a whole day to make, so if you think of the highest price you would pay for a custom model, it only takes a quick calculation to figure out that’s not a living wage. Any other models end up being made in the evenings and at weekends and I also have to fit in admin, networking/advertising… hence my current frazzled state. Once I start taking commissions again I may have to look at a better ordering system, probably one which allocates the amount of time I have available each month rather than having a massive work list stretching ahead of me with long waits for customers. 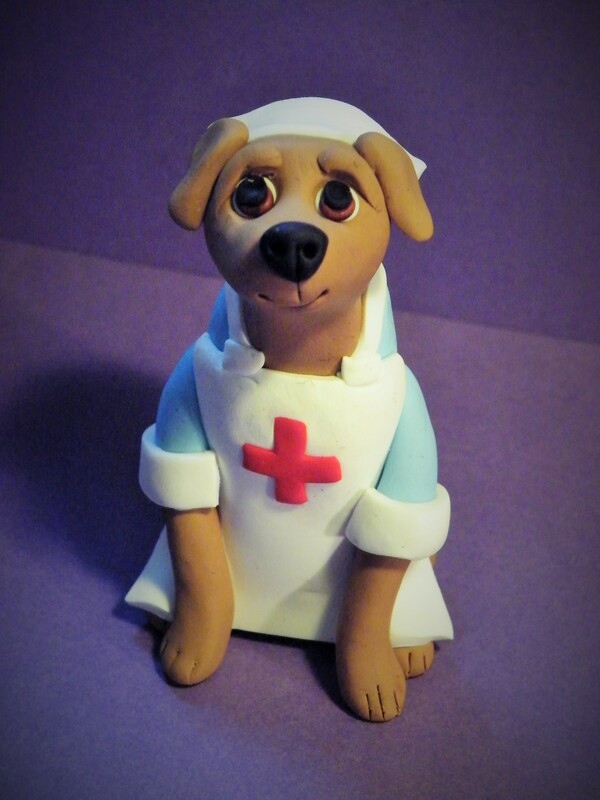 Most urgently, I need to restock my website with new ranges of ‘ready to post’ models – I have *so* many new ideas and I have had zero time to make them over the last couple of years. I have plans for a whole new Steampunk range, some more ‘Myth and Magic’ figures, more doodles, more rainbow dogs and flower dogs, ‘Dogs with Jobs’ (in various uniforms/work gear), Musical Dogs playing instruments, Sporting Dogs, Graduation Dogs… Seriously, no shortage of ideas. I’m also thinking of producing a range of printed goodies, like greetings cards and mugs and I would love to find some new stockists, especially if they are near Hebden – if you know of any, please give me a shout! One day, (after we move house – I’m not a total fantasist) I’m hoping I will also have time for some more diverse artistic projects and I might make a separate website for that. Some of this stuff has been on a back burner for years and it’s time to make it happen. So… challenging but exciting times ahead! If you’ve made it this far, thanks for reading and thank you all for your patience and understanding while I make changes (and tiny dogs). Bonus points if you got the Bowie reference in the title; come and talk music with me. I may actually write something here soon. Then again, this might join the growing collection of accounts floating neglected in the ether because I am a serial account starter (and forget-abouter). Which will it be? Let’s wait and see.